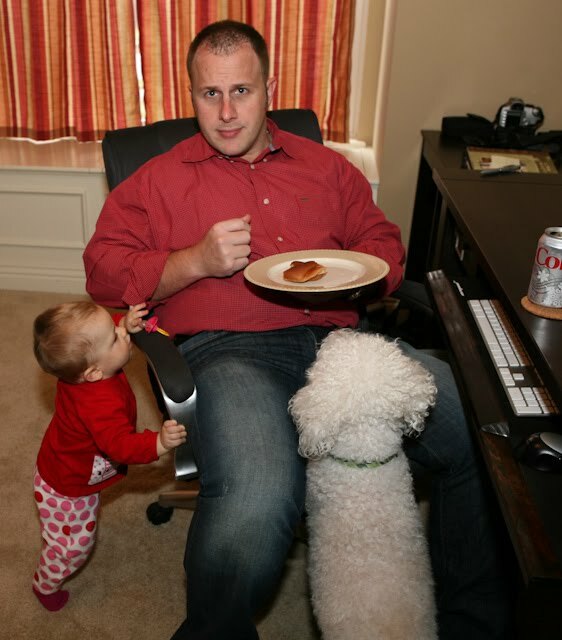 For the last 7 years - we have been used to Dawson begging at our knees while we eat our meals. But yesterday Scott was trying to eat lunch and suddenly he had two beggars. Ha! I couldn't help but snap a picture! When we found out that Harper was a girl - her aunt and uncle sent her this dress. I just love it. I dressed her up today to take her to Bible Study. I thought she just looked precious. She was in the nursery with about 4 boys but they had to take her over to the bigger kids room for a while because she was so loud and active. ha! All the younger boys were trying to nap! ha! Get used to it boys - I have a feeling it will be this way for the rest of your lives. The guys trying to nap and the women wanting to talk. ha! 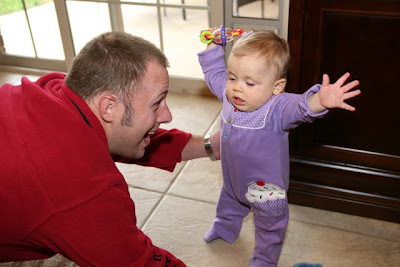 She is standing on her own a LOT now and today she has started trying to reach forward and step! Yikes ! I'm not ready for a walker! She always puts her hands in the air when she stands like "Ta Da!!" An anonymous blogger sent Harper this precious Christmas outfit and something for me. They didn't give me their name or return address so I just want to thank you if you reading this. That was SO sweet and Harper is going to be precious in that outfit. I can't wait for her to wear it! It came from here (http://www.julianneoriginals.com/) - thinking she is the one who sent it??? Just leave me a comment and tell me who you want to give it to and on Friday at noon I will draw with the random number drawing and pick a winner!!! I would love one of these shirts for my daughter. She is 8 years old, so it's hard to find "cute" clothes for her anymore. I would give it to my neighbor Sarah Kate! I would love to have one for my baby girl Caroline. I would like to give it to my 10 month old daughter, Abby. those are adorable! I would love one for my 3 yr. old daughter Lexi! I would love to have one for my daughter! I haven't found her the "perfect" Christmas outfit yet and she needs one! I would love a Christmas shirt for my 6 month old little girl! I would give it to my "baby" Alyssa, she will be 7 this Friday!!! :( Why do they have to grow up so fast??!!! Thanks Kelly, you are a true inspiration!! I would love to give a shirt to my niece Alyssa and daughter Madison 'cause I just love them soo much. The shirt is adorable! I would love one for my little angel that will be 1 on Dec. 3rd. I think if I win it I will have to order a matching one for me. Thanks! I would like it for my daughter Klara. She is so excited when she sees a K or her name. I was just looking to get a monogrammed something for one of my best friends who just had her sweet little girl yesterday! Ella would look precious in one of these!!! I would love to see it on my 1 year old, newley adopted baby girl, Gretta!!! I would give it to my 6 year old grand daughter - Bridgett. She would love it. Can't believe how big Harper is getting!! I would love to have one to give to my precious niece that lives 14 hours away from us! She is will be 6 months old at Christmas! I would give one of these shirts to a little girl named Aubrielle. 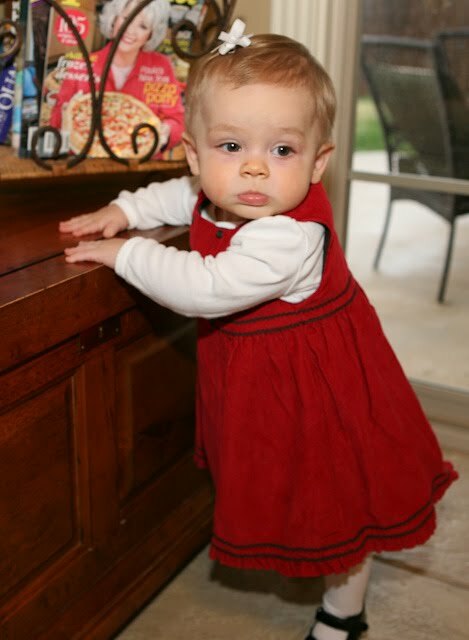 She is the daughter of some of our dear friends and she just turned one and is going to be a big sister in January! I would love to give my daughter one as I can't find cute monogrammed stuff for her at 8. I love these! I would love one of the shirts for my daughter! So cute. I would love to get a cute shirt for my precious daughter Madilyn, age 8 months! I would love a monogrammed shirt for my cute little 2 year old. Her name is Tessa! I would love a short for my son, 7. He will be getting too old for stuff like that and his big sister always gets these types of gifts. It would be nice for him. I would LOVE one for one of my girls- then I will just have to get the other one - one just like it...they have to match :) Girls are even more fun in pairs!!!! These shirts are adorable. I would love one for my son but being that it is the season for giving, I would give it to my brother in law's new baby girl. My 2 year old little princess would love a cute shirt like that!!! I think this would look adorable on my little Miss Chloe Wren! I would love to have one of the shirts for my 2 year old little girl named Payton. We are CRAZY about monogrammed clothes!! There is nothing like a father/daughter relationship. So sweet! I would love a shirt for my little niece, Reagan. So cute! Oh I would love to get one for my sweet niece Sophie who just became a big sister this month! I'd get one for my 4th month old molly! I would love a monogrammed shirt for my 3 year old daughter! My 6 month old daughter, Ava. oh Kelly she's so precious and I love how long her hair is getting. Its so cute! And I love the monogrammed shirts. Lauren would be sylin and proflin :) Amanda I are making wreaths tomorrow...wish you were here!!! I would love a shirt for my Allikaye, of course!!! I love me some giveaways!!! I would love one for my daugher Charlotte. I'd love a shirt for my 18-month old, Logan!!! It'd have to be for my daughter, Keevia! She was born on October 29th, and is pretty much adorable. I don't have any monogrammed clothes either! Harper is adorable with her arms in the air like that! what a cutie! I would LOVE one of those shirts for my 9 month old son Caden! Great pictures! I just laughed out loud at the beggers:) She is definitely going to be walking very soon! Get ready mama! My daughter, Sophie, would love a monogrammed shirt. We are nuts over it too. My sweet 2 year old Grace would look precious in one of these! I would love to give it to my sweet almost 4 year old daughter, Addyson! Thanks for the giveaway! How precious is her little gymnast stance! What a sweet little angel, I just want to cover her with kisses :). Believe it or not my son has NOTHING with his name or Monogram on it so I'd love to win one for him! Thanks so much for the giveaway!!! I would LOVE one of those shirts for my son Jackson! Those shirts are precious! If I won the giveaway I'd probably get it for my daughter. I would give it to my 1 year old son, Conner. Poor child never gets anything new for himself..always hand me downs from his big 3 year old brother, Cameron. I'd love to get a monogrammed shirt for my 19 month old son, JJ! I would love to have a monogrammed shirt for my daughter Keiley... she is 4 and doesn't have anything monogrammed. My little Brooks would look so cute in the Christmas shirt. Boys are so hard to put in monogrammed stuff but these are precious. I would love one for my boys! I would love to give it to my little bundle of joy Mya! I would like one for my best friend's son Isaiah! If I win it would be for my 3 year old Connor. I would love to have it for my 9 month old son. Cute! Cute! I would LOVE this for Chatham- I am just as nuts about Monogramming as you (and Harper)!!! So adorable...I think one of these would be perfect for my Lily. She's 5. My baby girl, Lauren, whom we call LuLu who turns 1 on December 19th! Too cute! My 2 year old Ashlyn would look stunning in one of these shirts! Thanks for all of your encouragement Kelly, love reading! I would give it to my sweet Analiese. We can NEVER find anything with her name on it! Harper is such a doll! I would love a shirt for my 2 year old. harper looks so pretty in red! I would LOVE to give it to my sweet baby girl Kallie! She is 14 months! those are precious! I think my 4 yr old Kyley Grace would LOVE it!!! Something tells me that your hands about to be even fuller with a walker on your hands, haha!! I would LOVE a shirt for my little man! He will be one 3 days before Christmas! So cute! I have a 2 year old and 6 week old- it would be for one of them and I'd buy another! I'd love to have one of those cute shirts to give to my foster son. We are trying to make his Christmas really special since we don't know how long we will get to celebrate Christmas' with him, or how special Christmas will be for him in a different home. My little guy would look quite dapper in a monogrammed Christmas shirt! So cute...I would give it to our son, who is due to be born in a few weeks! I would love one of those adorable shirts for my 3 year old lil girl. :) They are super cute!! My precious niece would be too stinkin' cute in the lime corduroy dress! Cute stuff!! I would love a shirt for my little girl! She won't be able to wear it this Christmas because she won't be here until February but next Christmas for sure! I would give it to my 14 month son Landon. way so cute...my daughter Addelyn is in major need of a christmas monogrammed shirt...so precious! I love these cute Christmas shirts. My daughter would love one - she is 17 months going on 17! So, obviously I would give the monogrammed shirt to Spencer. Believe it or not, he has never worn anything with his name monogrammed on it.!!! He does have some "lovies" with his name. He's getting big, so I better get a shirt on him before he knows to balk! Adorable! Would love one for my daughter!! I would give it to my 7 year old daughter Hannah!! The shirts are so cute. I am the proud grandparent of a 16 month little boy named Carter. Carter is our first grandchild and I cannot believe he has changed our life so much. We just love him to death and would love for him to have a shirt. Thanks. This would be perfect for our future daughter we are adopting from China...18 months would be a good guess on size, and her name is going to be Tatum!! I would give it to my friend's daughter, Gracie! Those shirts are too cute! This is so cute! I would love a shirt for my daughter who is 21 months old. She doesn't have anything monogrammed so this would be a first for us! I would love to get one for my 10 month old daughter, Emma! I'd love one for my sweet baby, Olivia. She has many cute Christmas outfits that were her older sisters, but she needs something special of her very own. I love the shirts they are adorable. I think i would give it to my nephew ryan who I lovingly call ryry..he is my heart! Harper is adorable and i think she just get prettier everytime i see her! christmas will be so fun this year for yall! elle would look too cute in that shirt! love it! I love monogramming and dont have near enough of it. I would give this to my darling daughter for Christmas outfit. I would love a shirt for my little girl!! I'd love a shirt for my daughter. Most of her holiday things are hand me downs from my niece, so I'd love for her to have something that is just for her! So cute! I would give it to my little girl Bailey. :) She'll be one 2 days after Christmas. I would love the shirt for my daughter Ava who is 7 weeks old. It would be adorable for her first christmas. I would give it to my great nephew Peyton. Hi! I'd love to have one to give to my daughter Payton. I would give my sweet baby girl the ornament shirt. I love that Rudolph pillowcase dress! If I hadn't already bought her about 6 Christmas dresses I would order it, maybe next year. Very reasonably priced! Great pictures of the little lady! Love the little beggers one! Oh I would get one either for my 3 yr old or 2 week old! I'd love to give this to my almost 2 year old, Harris. I would give it to my 4 year old niece, Londyn. She has a new little sister that she is having a hard time adjusting to. This would make her little day. She's such a girly girl. Harper is just too adorable!!! brody loves tupperware too!!!!!! She looks precious in her little red dress!! I love the shirts and would love one for my Brody!! I would give it to my daughter who just turned 2. I would love to give a shirt to my neice! I would love a shirt for my little man, Jackson. He's 3 and he woulb be precious in one of these! I would love a shirt for my oldest daughter. Her name is Annie and she can never find anything with her name on it. We always find Anna or Ann but never Annie. I am sure a shirt with her name on it would be very special to her. This shirt would be so precious on my 4 month old son, Lucas! i would love it for my 16 month old daughter. too cute!! I would love to have one for my 2yr old little boy, Zeke..
My sister has lost 98 lbs in a year (no surgery) and has nothing to wear. She was wearing a 2x and now a large/medium. I'm so proud of her and would love to win a shirt for her. I would love to give this shirt to my 16 month old son, Wyatt. It is so precious! I would love a shirt for my little boy, whose almost 16 months. Sometimes it's hard to find boy monogramming that's not too frilly for my husband's approval. These are adorable! I would love to give one to my niece, Ainslee, who will turn 2 in December! I would love to give this to my first little great granddaughter, Allie. I would love to get it for my God Son - Ethan. I would give this to my precious 2 year old little boy - Jackson!!! I would give this shirt to my god-daugther Sophia. She would love it! I would give it to my granddaughter, Emma Claire. They are adorable. I would give it to my niece, Danica. She would look adorable in the one with the Christmas ball. How cute! LOVE those Christmas shirts!! I've been looking for a few weeks now and haven't been able to justify getting any for my little girl!! Only 1 month to wear it but seriously she NEEDS some cute Christmas attire, right? It's her first Christmas too! Would love a 12 month size if I win!! 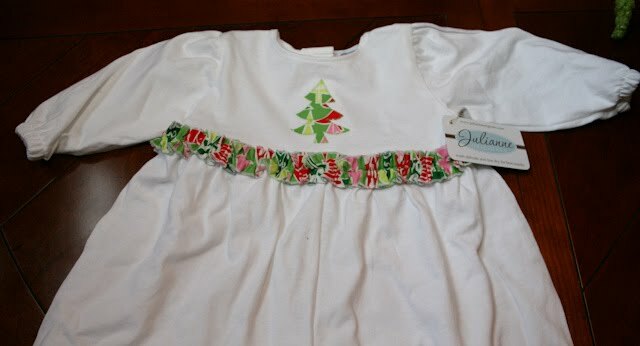 I would love to see my 16 month old in that cute little Christmas shirt. Heading over to the website now! I would love to have one for my sweet baby girl. Her birthday is in December so it would be just perfect for the Holidays and Birthday!! I would love to give one to one of my 4 darling granddaughters. I love the shirt with th truck and tree on it! Too cute!! This would look so cute on one of my daughters! I would love to give it to my 15 month old daughter, Emersyn Grace!!! SOO cute!! I would love one for my son!!! I can't believe that someone sent you clothes for Harper! That is so sweet...and the dress is gorgeous! I love these shirts,too. I think my little sister would look adorable in one. I would love this for my niece Brooke! I would love to have a shirt for my sweet JennaBeth!! Thanks for the chance to win a cute shirt for her. She is 8 months old. I have been following your blog for a couple of months now. In fact, i have always wanted to sponsor a child from another country and your trip inspired our family to sponsor a boy from Tanzania on Sunday night at the Travis Cottrell concert at our church. I just want to say THANK YOU for opening up your life to us crazy blogers on a daily basis. ALSO, I was shocked to see that my friend sent you that cute Christmas outfit. Her name is Julie from Julianne Originals and we go to church together and our kids go to school together (we are from Knoxville, TN). She is SO sweet and her stuff is adorable. I'm sure you can go on her website to find her address. Small world isn't it? I'd love a shirt for my little nephews! I usually find all kinds of stuff for my daughter...so I'm thinking this would be cute for one of my boys! I would give one to my 18 month old son, Mason Thomas! SO cute! These are so cute! I gave birth 5 weeks ago to a beautiful little girl at 27 weeks, weighing 1 lb and 13 oz, named Abby. In the last 2 weeks they have aloud me to put a headband on her and onesies for photo purposes. I remember reading you blog when Harper was in the NICU and you walked in and she had a little bow in her hair and how happy that made you, it's really amazing how something so little can mean so much. We probably won't beable to go home until after Christmas, so I would love for my little girl to sport a monogrammed onesie on Christmas Day. Thank you so much for sharing your life with us. I would love a shirt for my 21 month old son. I'd love to have one for my son who just turned one! They are super cute! I love those shirts! Beautiful.. I'd LOVE to give one to my 5 year old daughter! I would love one for my niece! Love the beggar pic~ looks like my house! Would love a shirt for my 2-yr. old boy- so cute! HA, I love that picture of Harper standing! Too cute!! I would give my daughter Kynlie the shirt. Too cute! I love readying your g=blog and keeping up with Harper and all of her monogrammed outfits...I would give it to my grand baby...she is only a couple of months older than Harper! I would LOVE a Christmas shirt for my two year old Madison Claire! Yeah! Hope I win! Cute shirts! I would give it to my godson who just turned 1 month old yesterday. He is my name sake so I think it would be cool to give him something with his name on it. I would love one for my son that is 12 months old! I would love to give this to my oldest daughter, Ainsley! I'd love one for my 17-month old daughter, Tatum. They are adorable! My little one would love something monogrammed! I haven't ever won anything before!! 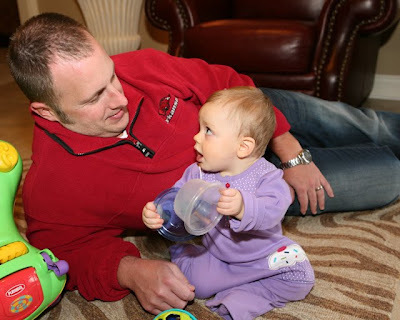 The Daddy/Harper pictures are so cute! She just loves him!! You can tell by the way they look at each other! So sweet! i have a 3 yr old son and a 9 mo old son but if i had to choose just one to give it to, i'd say the 9 mo old since this will be his first christmas! Those shirts are just precious and of course I would like one for baby Connor :) Harper looks ADORABLE in that dress too...so cute! I would love these shirts for my son Bryce. He is two and a half. We are searching for just the right Christmas shirt! I'd love a tee for my daughter (she's 6)! i would love one for my daughter mallory! I would love one for my little guy! My niece, Lyla! This will be her first Christmas! I would love to shirt for my 9 month old boy. I would LOVE to give this to my three year old nephew Lincoln. Hey girl! LOVE the picture of Scott with the 2 "beggars!!" I would love to get these shirts for Connor and Avery Kate! Precious! I would love to have one of these for my daughter, Emily. Enjoy those little days of learning to walk. Emily is 21 months, and it seems like the time has flown by. Last Christmas she was just about at Harper's stage, and now you can't keep her down. Thanks for the chance at the great shirt! 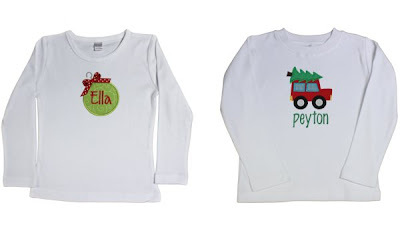 Awww, my daughter, Olive, would look so cute in that ornament one! I would give one to my daughter Ellia. I would love to give one to my best friend's little boy (20 months old) or my cousin's baby girl, who is due in February.